Regular readers of my blog will know how much we love the brand Cosatto. 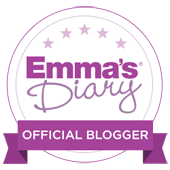 We have been lucky enough to use their Supa Go pushchair and the Hug Isofix Carseat, both of which we still use and love. We find the products are sturdy, well designed and in such bright beautiful patterns. 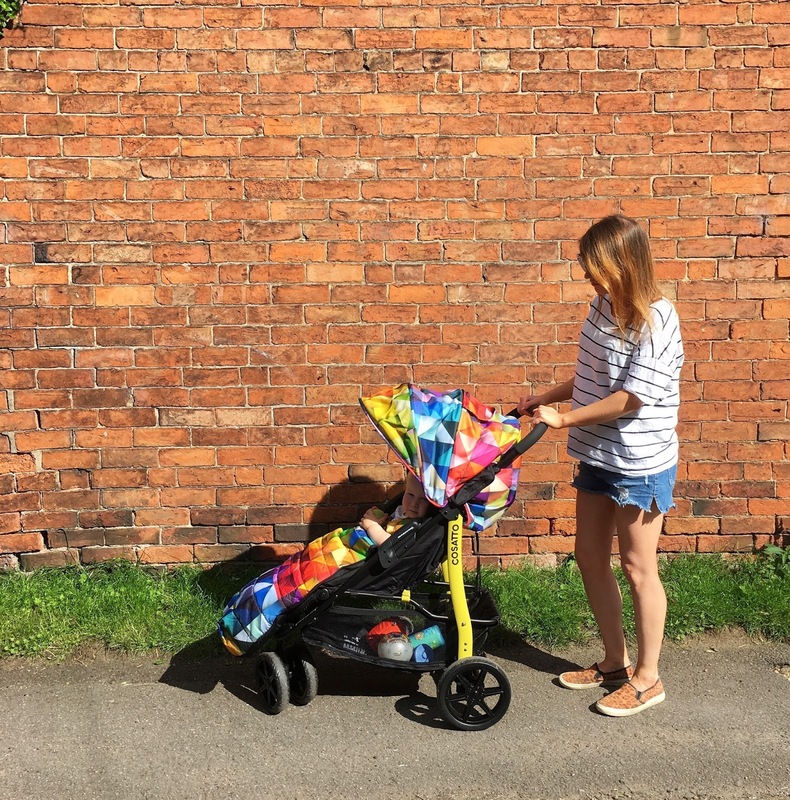 I was really excited therefore when the lovely people over at Cosatto got in touch to ask if we'd like to try out a new stroller which launched this summer; the the Busy. The Busy is a nippy 3 wheeled stroller, which is more sturdy in it's design than the Supa Go buggy we already have. It comes in three bright, bold designs- Spectroluxe, Electro and Seattle. As we adore bright bold colours, we opted for the stunning Spectroluxe design. It's so eye catching and we have already had so many compliments about the design. The Busy is described as a stroller for active types, and active is most definitely what we are as a family. 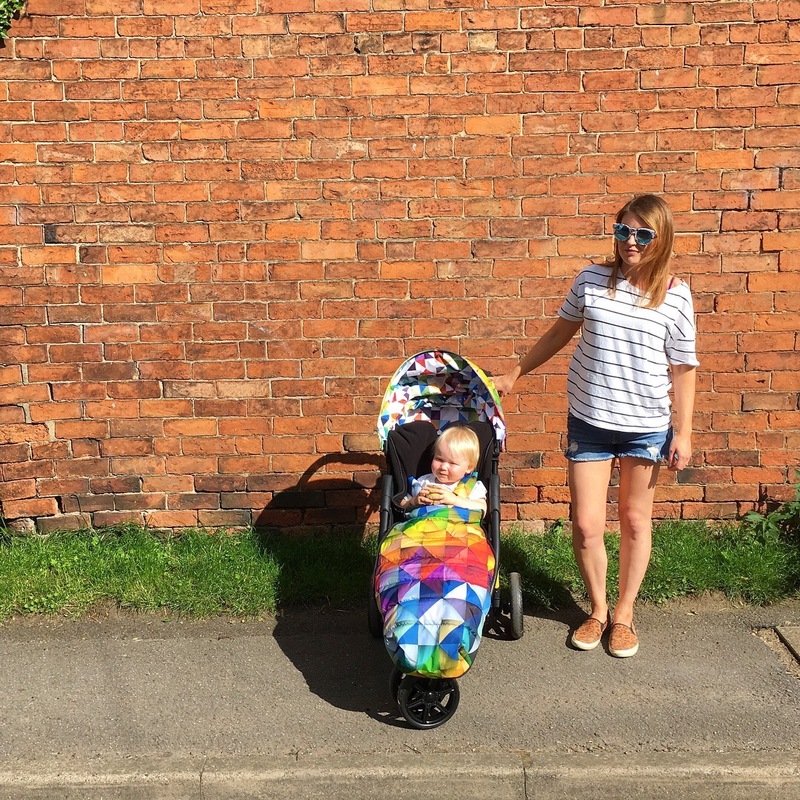 We live in the countryside and go out for muddy walks, treks through fields and along dirt tracks daily, but equally, we also head into town in the car or on the train quite often too, so I needed a stroller which was suitable for both situations. I was really intrigued therefore to see how it faired, both in terms of coping with rough terrain and also ease of use with using it about town. I'm always so excited to open up a box from Cosatto. I know I am always going to love the bright, bold patterns and they never fail to amaze me. The patterns just always have that 'wow factor' and the Spectroluxe certainly didn't disappoint. We put the stroller together in around 10 minutes and it was very simple to do. The design is curved and looks sporty, with a black and yellow aluminium frame. The stroller comes with a fleecy lined footmuff, which is like a big sleeping bag. Of course at the moment it's far too warm to use it, but come winter, it will be so cosy for Little L to snuggle up in. I did think it looked a little less 'wow' without the footmuff on so I'm looking forward to Little L getting the chance to use that in winter. I really loved the 3 wheeled design. 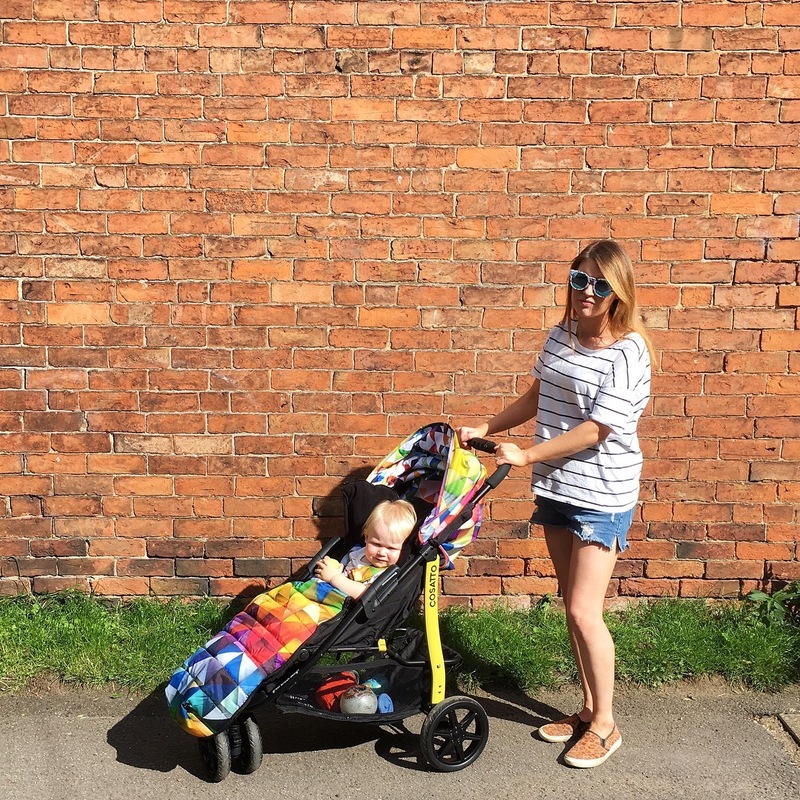 I've always favoured 4 wheeled pushchairs previously but we found the Busy so easy to push and steer, and I think just having the 3 wheels is what helps. One thing I did find is that I can't seem to get it to fold down terribly flat and it looked a little cumbersome in the boot of my car. It looks and feels like it's not quite folding down enough, but I do like that the stroller comes in just one piece, not separate chair and wheels like many other strollers. The other slight gripe I had was with the recline mechanism. It is a toggle with a clip you slide. I found it a little stiff to slide, and putting the pushchair back to upright position while L was lying in it was little tricky, but it has got easier with use. As I mentioned above, we live in the middle of the countryside and go on multiple walks a day, often traipsing across grassy fields. It pushes easily across the grass and even down our gravel driveway too. The wheels are chunky and plastic so there's so risk of them popping or deflating. It is just a dream to push it along pavements as it's such a smooth ride and getting around town and the shops is so easy. We've even taken the Busy on walks through forests (you can see in our video below!) and it coped very well with the uneven terrain. The basket on the Busy is just amazing. 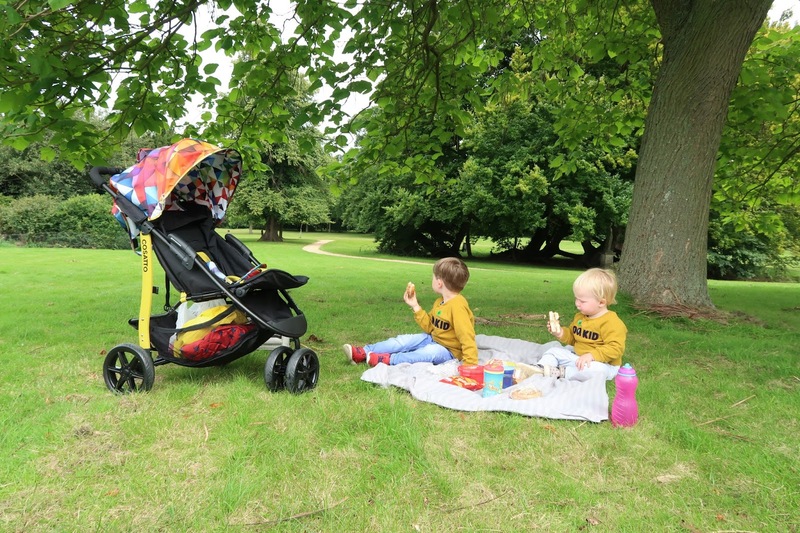 It's easy to access and really big, so perfect for carrying all your bits and pieces for a day out, a picnic, raincoats and all the other paraphernalia you end up taking with you on your toddler expeditions! Even though I'm not mad keen on the toggle to recline the stroller, it does recline back fully and Little L has had some brilliant sleeps in it. He always looks very comfy and cosy when he has a little snooze in it. The sunshade is not only gorgeously bright, but it's also a really decent size and perfect for keeping the sun off. I also really like the viewing window at the top of the hood so I can keep an eye on him and spot when he falls asleep. The Busy has a 5 point harness with padded buckle and shoulder pads. One thing I have found is that the buckle pad does come off quite easily and would quite easy to lose if it fell off. The Coastto Busy is currently £229.95 and comes with the Cosatto 4 year guarantee. Footmuff and rain cover are included. We also made a little video of us using the Cosatto Busy. 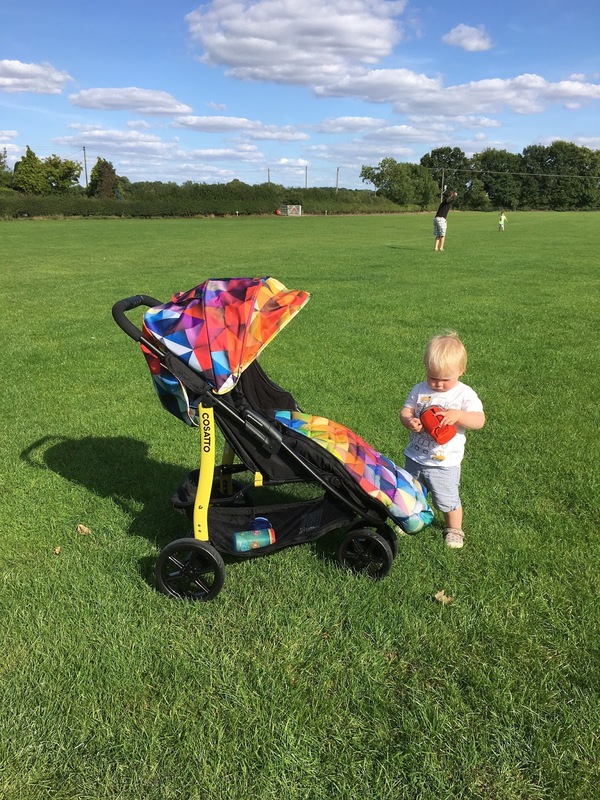 NB: I was very kindly sent the Busy Stroller by the lovely people at Cosatto for the purposes of this review. All opinions and photos are my own. Please don't use them without my permission. I love this pram! We had the same pattern but a pushchair one. It's fab isn't it. The basket on that looks a great size.